Residents of early Bronte Village were interested in improving their community and pursued active communication with town leaders. In 1939, the Society started work on the Gore - members ploughed, leveled, seeded, and were involved with ongoing clean-up and maintenance of the area. In 1947, plans were underway by the Society to purchase the Gore as a permanent park. The Society "thought it in the best interests of the community for the Village Commission to secure the Gore property." With a loan from pharmacist D.A. Allan, purchase of the Gore was accomplished. In the 1950s, the Society reimbursed a member who cut the grass at the park. The Society also planted trees and maintained the flower beds. In the spring of 1955, a suggestion was made: "When the Firemen practice their drill in the summer, they [should] be asked to water Gore Park, as the shrubbery and plants have a difficult time to survive during hot weather." Also, a suggestion was made to place posts with chain and white-washed boulders around the area to protect it from cars and pedestrian traffic. 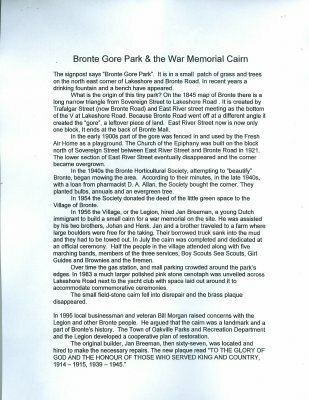 In 1956, the Society approached Bronte Council for reimbursement of the purchase of the Gore (the deed to the land was donated to Bronte Village in 1954). There is no record that reimbursement was ever made. 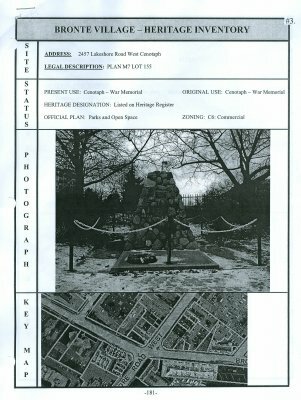 Earlier, the Legion had commissioned a memorial cairn to be built and took over management of the Gore. By 1956, the Society’s role had come to an end. Bronte Gore Park is a narrow wedge/triangular piece of land at the N/E corner of Bronte Road and Lakeshore Road West. It is the site of the Bronte Cenotaph - the plaque reads: "To the Glory of God and in honour of those who served King and Country, 1914-1918 1939-1945." The memorial was originally constructed in 1956 and is described as a mortared field stone cairn. A dedication ceremony was conducted on July 26th, 1956. After years of neglect, the cairn was repaired and a new plaque installed in 1995. 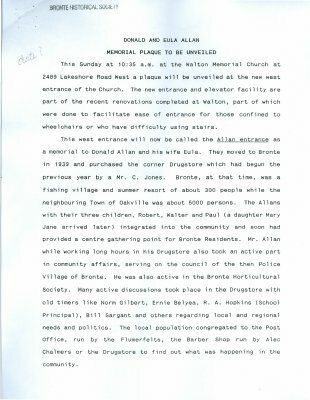 A rededication service was held on July 1st, 1996. 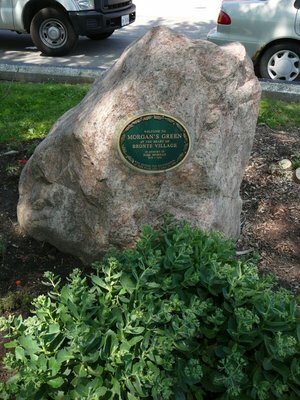 There is also a large boulder in the park with a plaque that reads: "Welcome to Morgan's Green at the heart of Bronte Village, in memory of Bill Morgan 1925-1996, who guided the restoration of this park and cairn in 1996." This park is registered by the Town of Oakville as a property of cultural heritage. The key stakeholder is the Royal Canadian Legion Bronte Branch 486.